The Grosses Schauspielhaus deserves some momentary and special analysis as it becomes the alembic through which many of Poelzig’s architectural ideas are distilled and rarified. Specifically, the remarkable contrast between the building’s interior and exterior is worth mentioning. 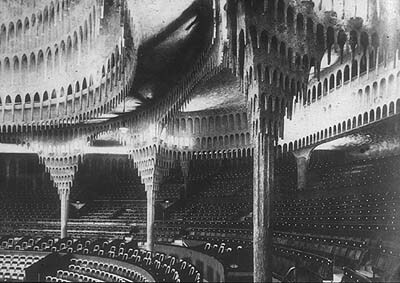 The “Stalactite Grotto”, the Schauspielhaus’ auditorium is perhaps the most-photographed and therefore most well-known part of the building. And if these figurative stalactite forms envelop the auditorium, the orchestra, as well as the proscenia, then what of the non-performative circulation spaces? A series of brightly-lit foyers with curved ceilings provide apertures to the grotto. Upon exiting (or entering) the auditorium space, one would certainly notice sets of lighted columns. These columns provide a perfect foil to the auditorium supports inside: instead of dead accreted matter, these supports look like lighted fountains. The grooved cladding runs upwards, as the column thickens, and explode in showers of light that literally drip down the curved ceilings and onto the walls. Yet these forms, expressive as they are, do not do justice to Poelzig’s own conceptual sketches. These depict the forms as columns of pure light, sessile supports blooming (or blowing?) up in phalanxes of fire and light. Yet outside, walking toward the main entrance of the Schauspielhaus … a completely different building. Across the street from this entrance, two neoclassical buildings frame the looming Schauspielhaus in back, for Poelzig’s signature building stands meters above these structures. One may very well sense that the Schauspielhaus is therefore a stage, and moving closer toward that building, one notices its dominant verticality. At grade, an arched Romanesque portico greets opens onto the street. The verticality of the arch supports is replicated in a series of taller, narrower, more numerous arches that stretch upwards, meeting an ever-so-slight gabled form. Yet this gable, and these arches are anything but, for they are more pilaster-like in nature, reliefs lightly hewn into the stereotomic weight of the Schauspielhaus’ façade. This small gabled relief just outwards from another gabled shape restraining a series of arches that are over twice as tall as the smaller arches. And finally, toward the top, this part of the building meets a basilica-like structure running along the spine of the roof axis. And, if for a moment, one were to step back to the point of this perambulation, to that point where the neoclassical structures frame the stage that is the Schauspielhaus’ facades, one could very well be overwhelmed by the successive layering of arched elements – a seemingly-infinite regression of vertical lines extending beyond, and reaching upward. These inconsistencies – a distinct organic métier in the auditorium, a decidedly classicist formal gesture for the facades – can be linked to Poelzig’s own education. Under the tutelage of Karl Schäfer, Poelzig developed an intense fascination for the structural elements of Renaissance and Gothic architecture. Although his contact with these styles came through the writings of Viollet-le-Duc and Ungewitter, Poelzig cultivated an unusual understanding of the relationship between form and structure. Poelzig articulated this relationship in a 1906 speech made in Dresden at The Third German Exhibition of Applied Art (Die Dritte Deutsche Kunstgewerbe-Austellung). At that time, Poelzig compared the use of historical cladding (and other historicist elements in architecture) as fermentation. This complex metaphor thus described a situation where an architect would use a historical reference without understanding the cultural genesis of that reference – a process comparable to drinking wine whose age had yet to be appreciated (i.e. unfermented wine). The term also described an era – like the one Poelzig worked in – where historic references were in a process of figurative fermentation. We also forget that the utilization of structures from earlier times for a building designed to meet the demands of modern life must be accompanies by an unmistakably modern adaptation of these structures, and that the correct use of materials and construction consciously adapted to purpose produce inner advantages that cannot be replaced by decorative embellishments, however skillfully applied. … for here everything from the first to the last is sham. This colossal, solid looking … building is a glittering stage set, a complicated, artistic, architectural mask of plasterboard. All the elements that seem to be growing, to carry, to support and vault are actually being carried, supported, vaulted. The entire mass of the building is suspended on the old iron frame. The whole thing is a web of wire with plaster thrown on it. The plaster has been modeled and then painted with bold colors. Here even the architecture is playacting. This kind of architecture, thrown up like this, has nothing to do with craftsmanship in the good old-fashioned sense of the word. There was a task, however, for which a similar venture into form and structure would prove beneficial. 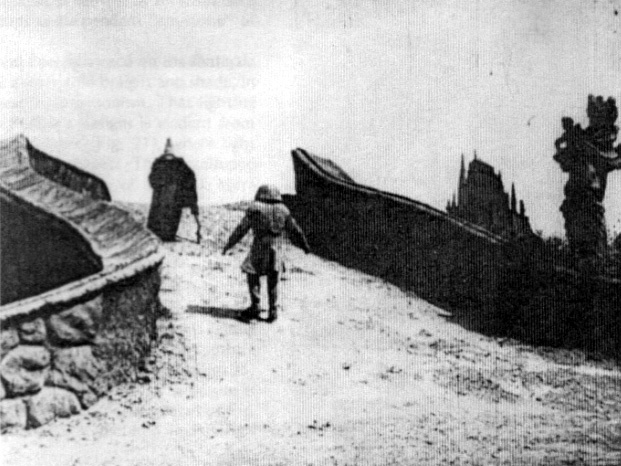 In 1918, the film director Paul Wegener commissioned Poelzig to design the sets for a third film version of Der Golem (The Golem). Poelzig readily accepted the job – their “shared interests in the mysterious and fantastic” undoubtedly “made the collaboration on The Golem easy and fruitful.” As for the 1920 film, it was Wegener’s third version of the Austrian writer Gustav Meyrink’s 1915 novel of the same name. The novel and the film share very little in terms of story line, with Wegner creating an unusual blend of Jewish mysticism and expressionistic élan. Yet the film has a distinct urban flavor – set in the 16th century it tells the tale of the scrupulous and shrewd Rabbi Löw, the most outspoken of Prague’s Jewish community. In response to a premonition that a terrible disaster would befall Prague’s Jewish population (shortly afterwards, local secular authorities would issue an edict to expel and relocate the city’s Jewish population), Rabbi Löw consults his own circle and they decide to build a Golem, an anthropomorphic clay-hewn monster that will protect the people. However, the monster loses control and begins destroying Prague. The finished sets thus have an angular, exaggerated feel, a true architecture of playacting. The only sense of verisimilitude that Poelzig deploys is not architectural – yet there is a sense that these structures convey a sense of psychological and spiritual dread. 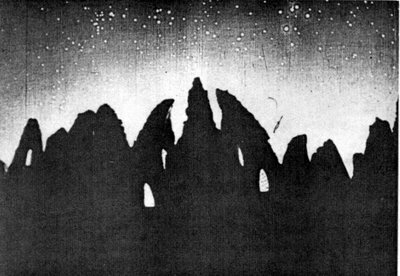 For example, in the opening moments of the film, a group of Rabbinic elders watch the stars, awaiting the fateful premonition that a terrible event will befall Prague’s citizens. On a dark-indigo tint screen, a mysterious constellation of stars hovers above an array of sharp, cragged artichoke-shaped silhouettes. There is no way in which a viewer can get a sense of the size or massing of these crags, but in silhouette, they look like a set of broken, upturned teeth. Poelzig replicates these angular, pointy motifs in his urban set pieces. In a long shot of a Prague city scene, steep, crooked, cracked gables retreat into the distance, creating a successive layering of light and shadow that only serves to frame and surround the masses of city dwellers in the middle. The triangular shapes are twisted and mangled, inadvertently showing the sections of the individual buildings. This layering of light and shadow is more evident in another frame, this one featuring a set of stairs reaching upwards underneath a large, arched bridge. A closer inspection reveals a complex interplay of surfaces – whereas in the previous scene the houses reveal a type of plaster and wood-beam construction, here, it looks as if the surfaces were hand-cut from stone. The tall, pointed, twisted city gate also combines the elements of light, shadow, and rough surface, creating an undulating structure that spins upward in an angle, coming together at a point that mimics the very same artichoke silhouettes from the night scene. Poelzig also uses these elements in set pieces that emphasize landscape. In one scene, for example, the Golem follows Rabbi Löw across a serpentine, rocky bridge. Far away, beyond the unseen end of the bridge a city’s gnarled and pointed towers and spires rise in the distance. On the side of the bridge, a witness to the curving, malevolent shapes unfurling across the landscape, a stone Madonna holds her own child. The venerated creator and created, mother and child thus gazes on its tragic analogue: a monster following its inattentive creator into an uncertain future. The Golem can be interpreted as a tragic tale about the relationship between a creator and the maligned offspring created in its image. And this is not insignificant as different variations of this relationship become more and more evident. For example, there is Paul Wegener himself, who played The Golem in all three films. Here, the creator of the film depicts himself as the errant, uncontrollable creation in the movie. Hans Poelzig’s sets for the film are almost an inverse of this relationship. Poelzig’s own errant, maligned “playacting” architectures (such as the “plaster and wire” Schauspielhaus) find a home within the dark, twisted logic of Wegener’s film.